You've accomplished something that few people do in their lifetimes. Now is the time to experience the enjoyment of showing off your family tree. We can print your family tree chart directly from Family Tree Maker, PAF, Generations Family Tree, Family Tree Builder, Legacy, The Master Genealogist, Tree Draw, OnePage Genealogy, Reunion, Mac Family Tree, and many other genealogy software programs that you design it in. Printing your family tree chart directly from your genealogy software application, as opposed to printing it from a GEDCOM file, means your genealogy chart will look exactly the way you want it to look because you control the design and layout. We can also print directly from any one-page PDF which you have created. 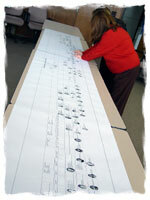 We can print your genealogy chart and have it in your hands within a matter of a few days. We ship worldwide, and overnight delivery is also an option in the U.S.
We can print virtually any size family tree chart you require. 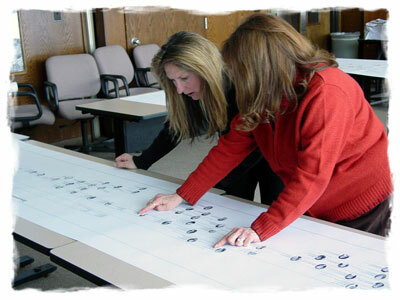 We can print any type of genealogy chart you design - descendant, ancestral, hourglass, or all-in-one. We can print any style of genealogy chart you design - vertical, standard, fan, standard pedigree or bow-tie. We can print your family tree chart in black & white or full color. We can print your genealogy chart either with or without any type of background. If your current genealogy program doesn't allow you to design charts for printing, we can import your GEDCOM data into a program that does and print a gorgeous chart like are shown in these examples. We can, scan, edit, resize and restore any photographs that you would like included in your family tree chart. You can send us your genealogy data online for free using our company drop box at YouSendIt. We also have the world's largest selection of blank genealogy charts that are ready to print and ship. We invite you to learn more about our family tree and genealogy chart printing services by watching our video and seeing examples of charts which we can design for you if you're not designing your own chart. And don't forget to download your FREE genealogy wallpaper and screensaver images and read about the 7 steps to preserving your genealogy data before you leave. If you love genealogy as much as we do, you'll love being able to share your hard work with your relatives, friends and neighbors in a way that brings excitement. Printing a large format family tree chart makes the whole story telling process about your family and your ancestors a fun event. in an interesting and meaningful way. difference between different types of family tree charts. Providing you with high quality printing from any genealogy software program, along with prompt, professional customer service is our main objective. If you have any questions about our genealogy chart printing services, please call us at 630-653-8400 or e-mail us at sales@ancestryprinting.com. International callers can also Skype us if preferred; however, we ask that you email us to set up a convenient time for a Skype to Skype call. We are located in the central time zone of the U.S. (GMT/UTC-6 and -5 in the summer), and can make arrangements for incoming Skype to Skype calls up to around 10:00 PM local time on most nights. We only accept Skype to Skype calls that have been pre-arranged by email.